Chronic pain can wear down an individual and negatively impact every aspect of his or her life. Stress, fatigue, depression, difficulty taking part in everyday activities or work, or damaged relationships can all accompany a chronic pain condition. However, this doesn’t have to be the case. With the right knowledge, treatment, and support, chronic pain sufferers can reduce their pain and reclaim their lives. Increased public awareness of pain and pain management can help accomplish this. Pain Awareness Month is all about getting the tools and resources for pain and pain management to the people who need them. September was established as Pain Awareness Month in 2001. A group called the Partners for Understanding Pain, comprised of more than 50 organizations, was responsible for establishing Pain Awareness Month. The American Chronic Pain Association, which was founded in 1980, spearheaded this effort. Since its inception, Pain Awareness Month has been a chance for the American Chronic Pain Association and its partners to increase awareness and communication about pain. Past Pain Awareness Month events have included workshops for medical professionals, press conferences, and more. Toolkits with factsheets, posters, CDs full of information, and other resources have also been distributed to thousands of medical professionals. Pain can have far-reaching effects on people’s lives. Whether or not an individual’s pain has a diagnosed cause, such as arthritis or fibromyalgia, it can have serious long-term effects. Some of these effects are understandable, such as sleep deprivation. Obviously, if someone is suffering from chronic hip pain, he or she will have trouble sleeping. In addition, however, several conditions that are not quite so obvious are associated with chronic pain. The effects of pain are all intertwined and can quickly become a vicious, repetitive cycle. If a pain sufferer’s mood is dampened, it might negatively impact his or her performance at work, which can in turn lead to stress that interferes with his or her relationships. Considering the profound effects that chronic pain can have on physiological and mental health, it’s no surprise that chronic pain is strongly linked to mental disorders like depression. Pain’s power is in its ability to deprive individuals of control in their own lives. With pain, though, knowledge really is power. If pain sufferers gain the tools to pursue treatment for their pain, as well as the know-how to cope with any remaining pain, they can take back control of their own lives. 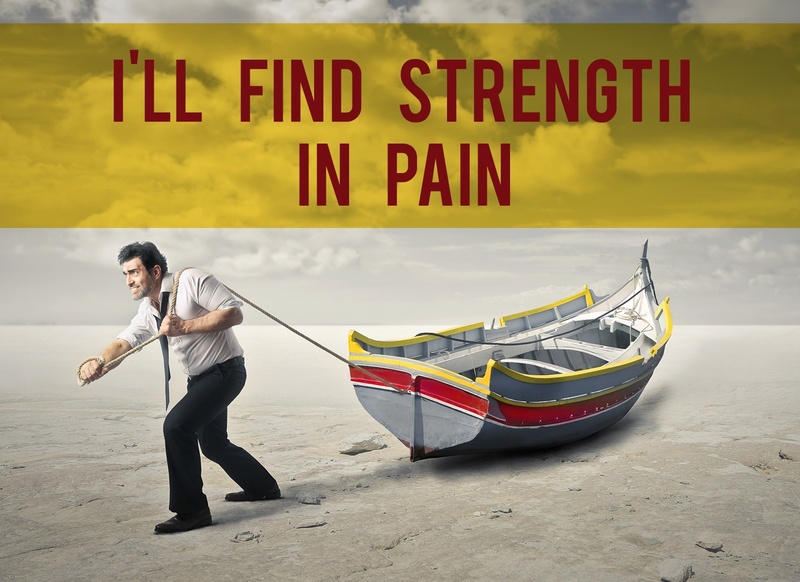 Fighting against chronic pain can allow people to find strength in pain. As stated by the American Chronic Pain Association, “Half the battle is won when you begin to help yourself.” Part of the battle against pain is pursuing treatment for it. Pain is the primary cause of disability in the United States, affecting approximately one in three people. A survey conducted by the Partners for Understanding Pain found that almost two-thirds of people thought that something other than chronic pain was the primary cause of disability. This lack of public knowledge about pain prevalence can make it difficult to discuss chronic pain. Additionally, many people believe that ignoring pain will make it go away or that admitting to chronic pain is akin to admitting to weakness. These are a few of the reasons that the public outreach during Pain Awareness Month is so vital. By increasing awareness about pain, these barriers to communication are lessened, making it easier for pain sufferers to reach out for support and treatment. A primary care physician is usually a good place to start pursuing treatment. Even if he or she is unable to treat an individual’s pain, he or she might be able to provide references for local pain specialists. The American Chronic Pain Association also provides several tools to enhance doctor-patient communication, such as pain logs and maps to help a physician thoroughly understand his or her patient’s pain. Additionally, there are many online resources to find pain specialists, such as PainDoctor.com. No one with a pain condition should have to feel powerless. There are countless resources for those with pain conditions. Support groups like Faces of Pain can reduce feelings of isolation. The American Chronic Pain Association has compiled many additional resources for pain management. Thanks to Pain Awareness Month, public knowledge and acceptance of pain and pain management is increasing. On top of encouraging people to communicate about and pursue treatment for pain, Pain Awareness Month can shine a light on the American Chronic Pain Association’s “Basic Rights” of people with chronic pain. These rights include making mistakes, asking for help, being taken seriously, and doing less than humanly possible. While it’s important to pursue treatment for pain, it’s also important to accept that sometimes it’s okay to ask for help or to take it easy. Successful pain management is not about pushing through the pain or getting through the day no matter what it takes; it’s about an improved quality of life. It’s about finding strength in pain. What will you do to celebrate Pain Awareness Month?